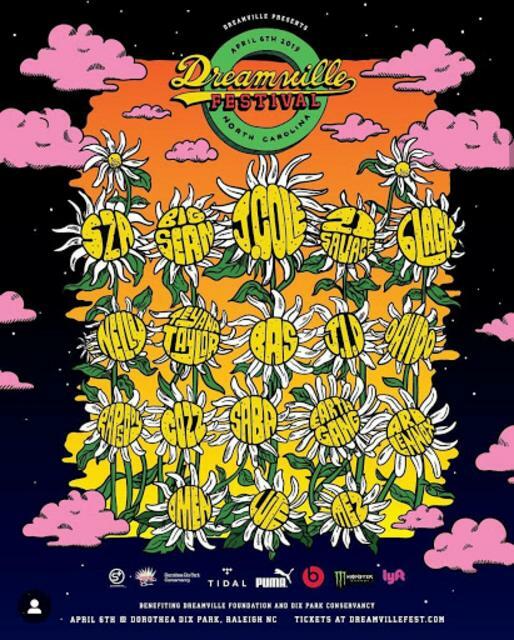 Top 5 Reasons You Should Be at J Cole’s Dreamville Music Festival Reviewed by Shumara Thomas on March 26, 2019 . The wait is almost over music lovers. Dreamville Festival will be here on Saturday April 6th!! It was originally scheduled to happen this past September but a severe tornado forced the team to reschedule. You’ve probably copped your ticket already (our Shutter16 readers are pretty smart) but just in case you’re still on the fence, we’ve got 5 reasons to stop hesitating. I mean, c’mon. Would J Cole steer you wrong? He’s one of the few level-headed hip hop artists leading the pack right now. He doesn’t flaunt expensive jewelry, overly priced gear, or showcase a lifestyle for you to envy. He gives you dope bars packed with truth and creativity. I feel like it’s not reaching to trust him on this one. We literally just got the full lineup a couple days ago and it was worth the anxiety. We’ve got SZA, 6lack, Big Sean, 21 Savage, Nelly, Teyana Taylor, Bas, J.I.D., Davido, Rapsody, Cozz, Saba, EarthGang, Ari Lennox, Omen, Lute, and Mez. All in one place for your listening pleasure. Rather than have to run and rough it out for an entire weekend, this Festival is conveniently only one day. Mind you it’s jam-packed. There’s even a Beauty Bar available for the VIP crowd, live painting, a full marketplace and a ton of food trucks including local favorite Big C Waffles. There’s a litany of happenings to choose from if you dare to need a break from the show itself. It’s a lot for one day but it makes life easier for those needing to find a babysitter, put in a day off or coordinate with procrastinating friends. You don’t even have to use a vacation day if you plan things accordingly. Look at God! Dorothea Dix Park is gorgeous. Between the daffodils and the amazing sunflowers that grow there, this park is where Raleigh-Durham folk love to be seen, photographed and recorded. It’s currently undergoing a huge revamping and restoration of the area. It’s the perfect NC setting for a hometown NC artist like J Cole’s first festival. In case you missed reason number #1, I felt like we had to bring it back again. Seriously, there’s nothing like being there “the first time.” There will never again be a first festival thrown by J Cole. We all as music fans get to be a part of something historic. As southern hip hop fans, this festival is a huge step for the hip hop culture. So many firsts, so many feels and it’s right here in NC. You only really need one good reason to attend so pick yours, grab your tickets here and make sure you’re following Shutter16 and Dreamville on social media to stay up-to-date on everything Dreamville Fest related.